Window Sash Balances are in stock at Progressive Controls Pty Ltd: 129 Gladstone Street, Fyshwick. We keep stock of spiral sash balances (or ‘window spirals/springs’) for double-hung timber windows and aluminium windows. Of course, we carry other window and door hardware too; Some items are quite common and others are a little rarer, e.g. another rare stock line we keep in-store are casement window winders (for steel windows that are hinged left or right & swing on the horizontal axis). 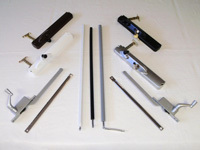 Q: Where do you go for lock sets, door handles, awning window winders, casement window winders, sash balances, weather seals, automatic door operators, automatic gate operators, boom gates, electric chain winders, hydraulic door closers, cam-type door closers, pivot door closers, transom closers, overhead closers, track systems for screen doors + handles & locks, solar screens (koolshade). A: Progressive Controls Pty Ltd.